Right beside the town hall in Provincetown, on the tip of Cape Cod, was a favorite outdoor sidewalk cafe called Cafe Poyant. Next to the cafe was a bakery with French pastries and donuts. Who remembers the place? It was a great place to “people watch”. The red and white awnings were classic. The large white building in back, once a church as shown on some of the earlier postcards on this website, was the Art Cinema movie theater. They showed wonderful foreign films. The bakery and cafe were owned by Gene Poyant, who in his later years volunteered as the Provincetown Town Crier. Today there is no outdoor sidewalk cafe at this location. As the town has continued to grow and expand. stores and restaurants change, although some favorites remain. 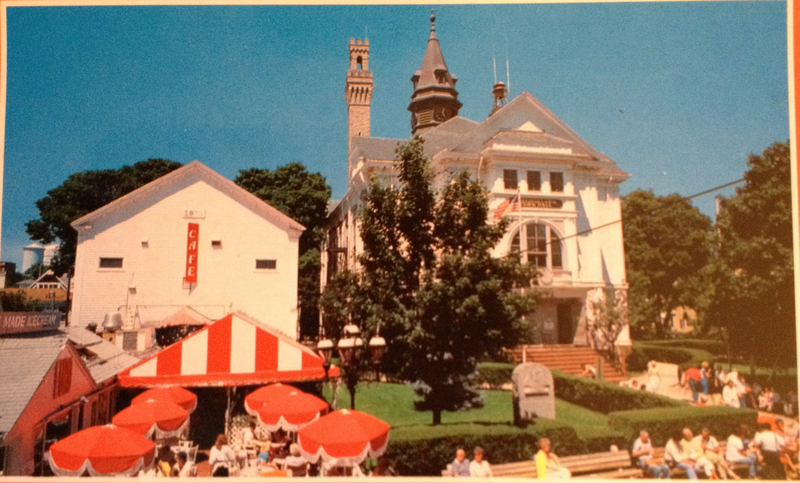 What did it feel like to live in Provincetown year-round 25 years ago? If you’ve read Remaining in Provincetown by S.N. Cook, you might have gained a different perspective. If you haven’t read the book yet, read what everyone’s saying about it. Now available at Amazon.com and Barnes & Noble and other online sites in trade paperback and on kindle. Signed copies are at the Provincetown Book Shop while they last. Like us on Facebook. Keep the conversation going.